Since it happens to be the last day of the month, I think I'll do a January wrap up. Here's what I was able to accomplish this month. First of all, my one monthly goal. Heidi at Red Letter Quilts started OMG to fill the void from ALYOF not being around in 2016. I chose a circus-themed Project Linus quilt. (I was goal setting post #63.) I finished it today! I had just a little bit of the binding left, and I did it in the car on the way to the zoo! We didn't get back until late, so my picture isn't great, because I missed the natural light. But it is done and ready for donation at the February meeting. The smaller squares are I Spys, and I tried to get as many that were circus themed as I could. Some are a bit of a stretch :) But others are right on--there are peanuts and circus tents and lions and tigers. I'll try to get a better picture soon. The circus quilt was also on my list of Q1 goals for the Finish Along. My goal setting for that project is here. I'm also linking up with "Goodbye UFOs" at The Crafty Quilter. I did my first month of both the stash bee and the rainbow scrap challenge. Both were successful, and I look forward to finding out tomorrow what February has in store for me. I'm also kinda sorta doing the UFO Challenge at All People Quilt. I listed 12 projects that I hope to complete or make progress on during the year. Their thing is that they draw a number and that's what you work on that month. I'm not really doing it that way, but it happens that January's number was 2, and 2nd on my list was the Midnight Mystery Quilt. I had been really behind, and I now basically caught up! I have my top completed to the point of the pattern. I plan to add a border, but I needed more fabric to do so; it's been ordered but not arrived. So I'm stalled for the moment, but I made great strides this month. I set some general goals for the year, and one was to complete and donate 12 Project Linus quilts. I took three quilts to the January meeting, so one month in, I'm already at a quarter of my goal! Hey, if I can keep up this level of productivity, it will be a great year! I'm ready for February! I decided to join the Rainbow Scrap Challenge this year. It's been going on a few years, I think, but I just learned about it. The idea is that each month there is a color, and you use scraps of that color to make something. There's not much in the way of rules, which I like. Some people do entire projects out of that month's color; other people pick a block for the year then make one or two each month, and at the end of the year, they have a rainbow of blocks to turn into a quilt. I decided to go for the "pick a block and make some each month" variation. Just a few days after I saw the challenge, I had the Summer 2014 issue of Quilter's World checked out from the library and I saw a scrappy butterfly block. It was designed to be a mini-quilt, but I thought a rainbow of butterflies would be awesome. I made a few changes to better suit my style. January's color is blue. I figure I will decide how many blocks to make each month based on how many scraps of that color I have. Since I have so a lot of blue scraps, I looked for light, medium, and dark scraps and made three butterfly blocks. I used a single background fabric for each butterfly because I like that look better than a scrappy background within each block. But I still want all of it to look and be scrappy, so backgrounds will vary. This will be my first time linking up with Oh Scrap! I am typically not a perfectionist as a piecer, as perfectionist quilting is not my thing, but I was super careful with this one! It's totally different when it's for someone else. I can tell that my skills and precision will get better with this bee, which is awesome. It's also really neat to make blocks that I normally would not consider. I can't wait to see what the February Queen chooses! I discovered the Finish Along at the very beginning of 2015. I participated every quarter, and finished 24 projects. I think it's unlikely that I'll match that, but I am excited about working on getting projects done, and I like to see what others are working on. I'm dividing my goals into 3 sections. This is far more than I will do in 3 months, but I never know what I will be in the mood to work on, and there is no penalty for not finishing by deadline. I've been doing the Midnight Mystery quilt hosted by Cheryl at Meadow Mist Designs. I'm a little behind, but I want to at least get my top finished by her deadline of March 8th. So my husband decided on Munchkin's second birthday that he wished we had a growth chart. He didn't want a wall stick-um sort, so we started looking at panels. We didn't like anything, but I found some great project ideas just doing a general image search. I've meshed a few patterns together and will use some of the I Spy strips from my strip swap last year. I'm really excited about this one! I've been wanting a sewing machine cover for a while now. I found a great tutorial by Vanessa of The Crafty Gemini, and I plan to use batik scraps. My ironing board cover is super ratty, but I haven't been able to bring myself to buy a new one. And then I figured out why--I might make one! I will use this great tutorial. I am not a selvage collector, but I do keep my I Spy strings, and I think I could make a really cool ironing board using them. I've been working on a batik hexies mini. This circus fabric was donated to my local Project Linus chapter, and the other ladies decided that I needed it. I have paired it with some circus-themed I Spy squares. This one is layered and quilted, it just needs to be bound. My friend Snow recently gave me a big bag of 2 1/2 inch strip scraps, and I sorted them into 2 Jelly Roll Race quilts. I finished the first one; this is the second. Did I mention that I'm into strips right now? This was a great deal on a mini jelly roll, and I plan to use an online tutorial I recently found. My mom gave me this wizard fabric, and I bought some batik fabrics with stars to go with it. I have a plan for this, I just need to do it. I modified this pattern to work with 2 inch squares. I've got the arrow parts made. I bought myself a Go! cutter for my birthday, and I got a lot of gift certificates for dies for Christmas. One of the dies I bought that I am itching to use is this Alphabet die. (Several projects on this list will utilize this die!) I'm going to use a pattern from Accuquilt's website and some scraps plus I Spy charms for this one. I'm linking up with the FAL, hosted by several blogs worldwide this year. 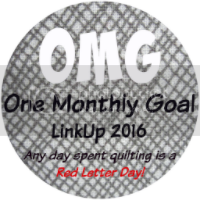 To fill the void left by ALYOF, Heidi from Red Letter Quilts started OMG, or, One Monthly Goal. Heidi & I did the same mystery quilt last year, and I absolutely loved her version. I'm glad to have a monthly goal-setting party again. I pieced this circus-themed Project Linus quilt over the holiday break, and it has been layered with orange fleece. (I use fleece instead of batting/backing in almost all my Project Linus quilt. It's easier to layer; it's cheaper; it's a good weight, especially in the south; and I love the softness/cuddle factor.) My goal for January is to finish it--quilt it and bind it. Yesterday, I finished this Project Linus I Spy quilt. The pink butterfly print was donated to my local chapter, and I looked through my stash of I Spy squares and looked for ones that are girly but not pink. I had a miscut with the pink so it wasn't quite as big as I like, so I added a border of a purple stripe, and the binding is scrappy pink solids. This was on my list of Q4 goals for the 2015 Finish Along hosted by Adrianne. The linky is still open, so I am linking up, even though I finished in 2016. I think that's legit. 2015 was the year I found the online quilting community. Oh, I knew it was there, kind of, but I hadn't really ventured in. I decided at the beginning of the year that I would track my finished projects. I had created a blog to facilitate an I Spy Swap and I decided to use that forum. Not long after deciding that, I learned about the Finish Along, hosted in 2015 by Adrianne. This is a quarterly goal-setting adventure where one lists unfinished projects and aims to complete them. In April, I found A Lovely Year of Finishes. This is a monthly goal-setting program where you pick 1 project to complete that month. I participated every month from May through December. I even won a prize in October! This program will not continue this year, but I really feel like it helped me finish things and am glad I found it. In the spring, I started my first mystery quilt, which was also a quilt along. I liked it so much, I joined a second one in the summer. The first one, I finished. The second is still going on. I did several projects that were patterns or skills or techniques on my bucket list. I also did zippers for the first time in 2015, and am not longer super-intimidated by them. I'm not sure that I have a total number of completed projects for 2015, but I completed 24 projects with the finish along. That's an average of 2 per month! Some were bigger than others, some were more complicated than others, and some were already pretty far along when I picked them back up, while others were started fresh. One thing I am particularly pleased with is that I had a few long, long unfinished projects that I finally put the last stitch into in 2015. On that list of 24 projects, 3 were what I classify as a long-term UFO, meaning it has been unfinished for longer than 2 years. My oldest UFO was started in 2002 or 2003, and now hangs on my wall at work. I will continue with the Finish Along, which is quarterly and runs all year. Beyond that, I wanted a little bit of a plan. I was interested in Pat Sloan's UFO Busting Plan, but her specific process doesn't work for me. I also like the idea of the UFO Challenge hosted by All People Quilt, but I don't like having what to work on when decided for me. So I'm kind of combining both and doing it my way. I'm also involved in 2 year-long commitments. On is the stash bee, which I'm super excited about. I'm in Hive 3. Each month, one of our eleven hive members is Queen Bee, and she chooses a block. Each person in the hive makes her a block (or more, if they choose) and mail it to her, so she'll receive at least 10 blocks in her month. I'm Queen in September, and I'm already thinking about what I want. So those are my goals for 2016! 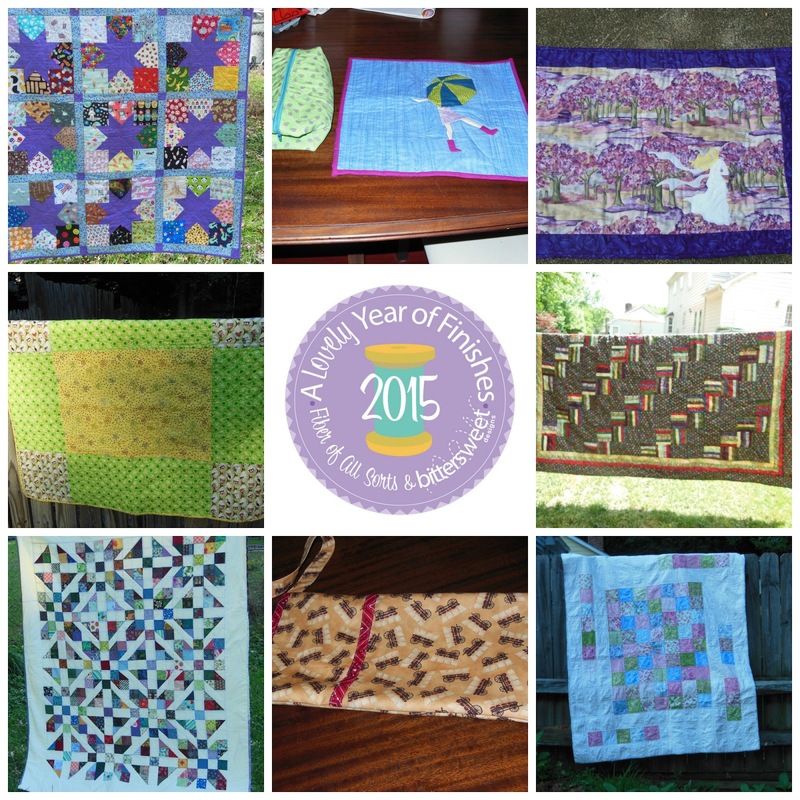 If I can even come close to keeping up with 2015, I will be a happy quilter! I discovered A Lovely Year of Finishes hosted by Melissa and Shanna about 7 hours after April's goal-setting ended. I participated from May on through the rest of the year, and didn't miss a month. 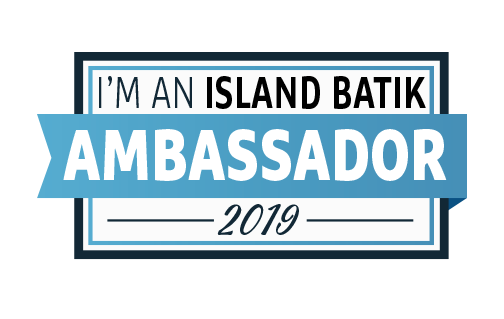 I found the experience fantastic--it was fun to be a part of something, the motivation was great, and I had a lot of fun looking at everyone's projects. I even won a prize in October--patterns from Honey, Bunny, and Doll. Here are my linked goals and finishes. Please note that I changed the name of my blog mid-December, so most of the links in the original linkys will not work, but they are all still here. I finished hand sewing the binding on this quilt last night just before 10pm. My friend Snow gave me a bag of I Spy scraps that were 2 1/2 inches wide and various lengths. I sorted through her scrpas and broke them up into 2 groups. I added a few of my own scraps, and used a donated moon & stars fabric for the little squares in between the strips. I like the Jelly Roll Race pattern for scraps, but the problem I always have is getting the size right. I was lucky enough to have a little bit of the moon & stars fabric left. I had planned to use it for binding, but I used it to make the proportions a little bit better instead, and went with white solid binding to use up some leftovers.